Der Artikel Reinhard Keiser (1674-1739): Fredegunda wurde in den Warenkorb gelegt. 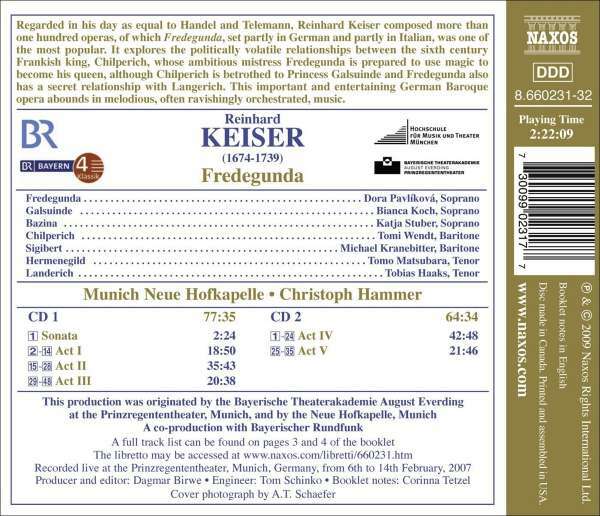 Regarded in his day as equal to Handel and Telemann, Reinhard Keiser composed more than one hundred operas, of which Fredegund, set partly in German and partly in Italian, was one of the most popular. It explores the politically volatile relationships between the sixth century Frankish king, Chilperich, whose ambitious mistress Fredegunda is prepared to use magic to become his queen, although Chilperich is betrothed to Princess Galsuinde and Fredegunda also has a secret relationship with Langerich. This important and entertaining German Baroque opera abounds in melodious, often ravishingly orchestrated, music.